(Updated) As the Midwest braces for a polar vortex, Chicago officials promise extra outreach and shelter capacity to assist homeless people, knowing they face life-threatening conditions in harsh weather. It’s proving a stark reminder that, as a prosperous city, we must do something substantial to end the homelessness that impacts more than 80,000 children, youth and adults in Chicago. “The steps that the city of Chicago and its partners are taking to provide shelter and warmth to people experiencing homelessness in this weather are critical,” said Executive Director Doug Schenkelberg. Working with shelters, the city added 500 extra shelter beds this week, 13% above usual capacity, DFSS officials tell CCH. Some overnight shelters are running 24/7 schedules until Friday, including youth shelters run by The Night Ministry (The Crib) and La Casa Norte. The city designated five CTA buses to act as overnight warming centers, including buses stationed at Des Plaines and at Columbus Drive. Four other warming centers have extended hours, 9 a.m. to 8 p.m. Tuesday through Thursday, and 9 a.m. to 5 p.m. on Friday. These community service centers are at 1140 W. 79th St. (Englewood), 845 W. Wilson Ave. (North Area), 8650 S. Commercial Ave. (South Chicago), and 4312 W. North Ave. (Trina Davis). The city also operates a network of warming centers across the city that includes the libraries, police stations and park district facilities. Chicagoans should call “3-1-1” for weather-related help in frigid winter weather, including information or access to homeless shelters or city warming centers. In emergency conditions, including concerns about someone struggling on the street, call 9-1-1. The Night Ministry health outreach bus assists people every on Monday through Thursday evenings and Saturday afternoons; location and schedules here. Thresholds also offers regular outreach, including a CTA Project Team. Salvation Army has teams working daily throughout the city, assisting people into shelters, including its Freedom Center warming center (with volunteer help being recruited). Lyft is offering up to two free rides to Chicago warming centers, up to $25 per ride, through Friday at 11:59 p.m. to those using the code CHIJAYDEN19. StreetLight Chicago, a free mobile app for homeless youth, provides service alerts and lists resources that serve unaccompanied youth through age 24. The free app can be downloaded from iTunes or Google Play. Homeless people can seek legal aid by phoning the CCH Law Project at 1 (800) 940-1119. Circuit courts in most Illinois counties, including Cook County, have announced they will be closed Wednesday and Thursday. Circuit Court of Cook County has advised that anyone with a court date on Wednesday or Thursday should monitor the mailing address used for court to find out when their case is rescheduled. Information about rescheduled cases can be found in the court’s General Order: http://www.cookcountycourt.org/Portals/0/Portal/GAO%202019-02.pdf. Suburban shelter systems, working with local congregations, have opened additional warming centers during the severe weather. South Suburban PADS announced added hours and sites through Thursday. Housing Forward opened warming centers in west suburban Oak Park from 7 a.m. – 7 p.m. Tuesday through Thursday, with overnight shelter offered after 7:30 p.m. It also requests donations of CTA cards and outerwear to distribute to clients. In Aurora and in the north Cook and Lake county suburbs, expanded outreach, shelter and warming center options were outlined by the Daily Herald. Chicago Coalition for the Homeless invites the public to work with us to find permanent solutions to homelessness. Learn more about our Bring Chicago Home campaign. 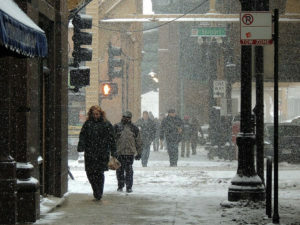 WBEZ: Out in the cold – where do Chicago’s homeless go in the winter?